After swatching all of the soft Zoya Petals polishes, I thought they would make a very pretty watercolor-like saran wrap mani, so I had to try it out. 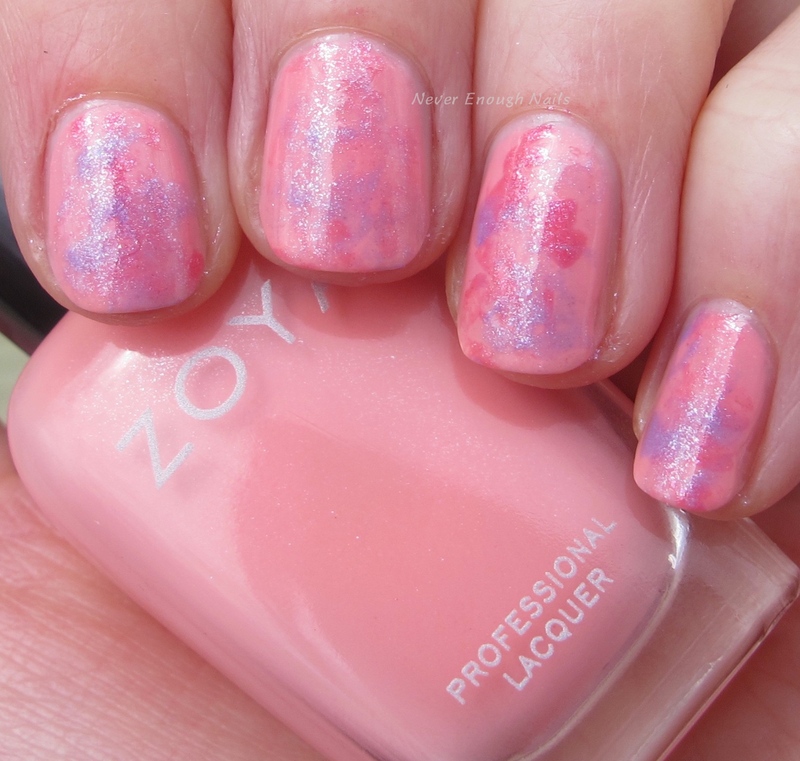 For this look, I used two coats of Zoya Tulip for my base. When that had dried completely, I painted some dabs of Zoya Azalea on to a piece of balled up saran wrap. I dabbed the saran wrap onto my nails randomly. Then, I used a clean section of the saran wrap and applied Zoya Aster in the same fashion. Finally, I cleaned up any excess polish with a brush and acetone (or at least I thought I did! I missed some shimmer on my index finger, whoops!). I wanted this to look dreamy and just splashed on, so I really did it very haphazardly. I love the look of the shimmer polishes dabbed on top of the creme! These polishes worked perfectly for a saran wrap mani. They look gorgeous together, like a spring garden. Definitely give this a try at home!